"WE MADE THIS FOR YOU!" NEW WEBSITE AND DRAFT PARTY! We are so very excited to announce that we are officially launching our very own website www.stlchiefs.com designed by our very own Bryan Bealmear of www.bealmeardesign.com. 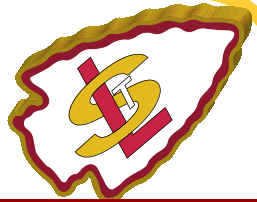 STLCHIEFS.com will be our new official home and this site will still continue to function as a blog that will be accessible from the main page. Also, we will be meeting tomorrow night (Thursday April 25) at Weber's Front Row (www.webersfrontrow.com) in Webster Groves at 6:30pm for the Draft. We are very excited to see who the Chiefs will pick and then theorize about what that means for roster moves/season. 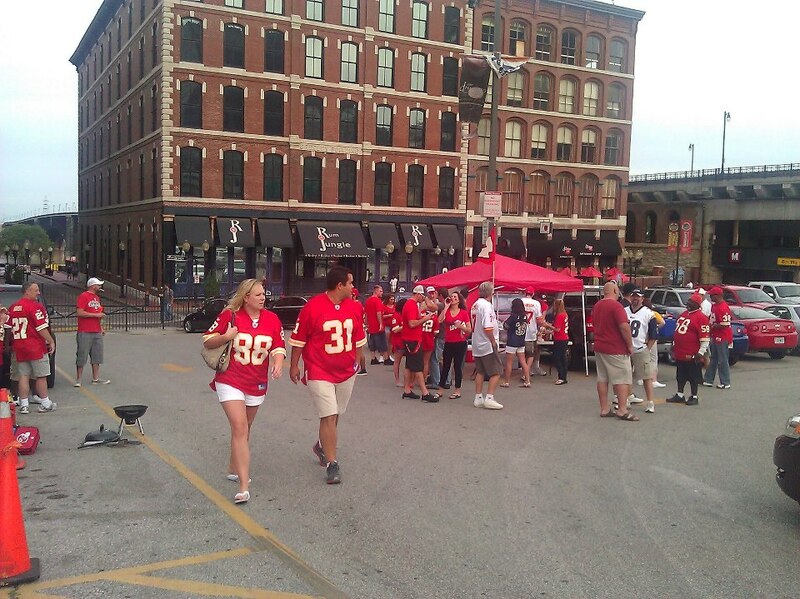 Come join us and hang out with other Chiefs Fans. It's been awhile since our last update here at STL Chiefs but we have not forgotten. Finally starting to forget last year's season and looking forward to starting a new one! We have some very exciting things planned this year as well as the announcement of new mediums for STL CHIEFS! For starters, we are proud to announce that we are working on a website and have secured the domain name, www.stlchiefs.com. 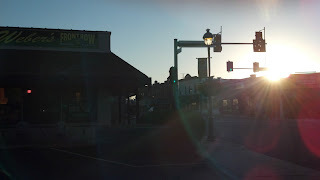 This website will be much more inclusive and easier to navigate than this blog. 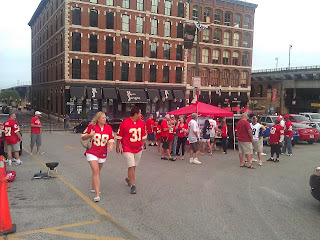 We will then be using this blog to post articles/information/opinions on the Chiefs and STL CHIEFS. We are also working on a designing a logo and plan to reveal it as the season nears. One other thing I want to mention is that our very good friend and author Michael MacCambridge, a longtime member of STL CHIEFS, will be at the St. Louis County Library April 4th at 7pm to discuss and sign his new book "Lamar Hunt: A Life in Sports. "Michael is a successful sports writer and has a great deal of knowledge about Chiefs Football. 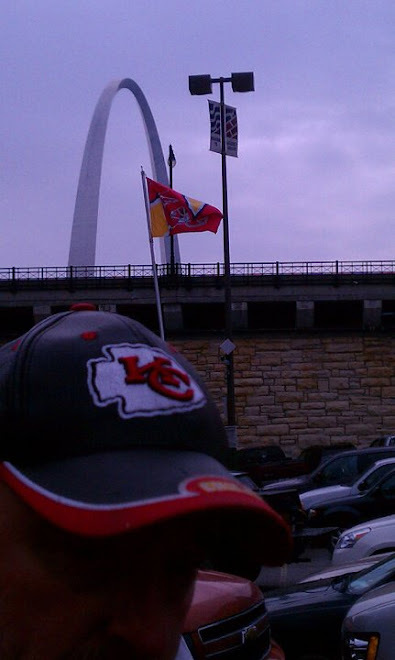 He lives right here in St. Louis and is a great resource to have around on game days. Please support him and grab a copy of the book. Football, is still a ways off, but there is plenty to still be excited for. It will be here before we know it! Stay tuned for more info. See ya at the Library! The Chiefs are 1-2 and headed back home for a division rivalry game with the SD Chargers. The past two years have produced wins. Come join us at Weber's Front Row this Sunday at 12pm (9/31/) for the game. Chiefs game will be played over the speakers and there will be specials. Last week's game against the Saints was a crazy one! Let's see how the Chiefs can pull off another win this week. Opening Week A Success! (minus the loss) Who's Ready For Buffalo?? 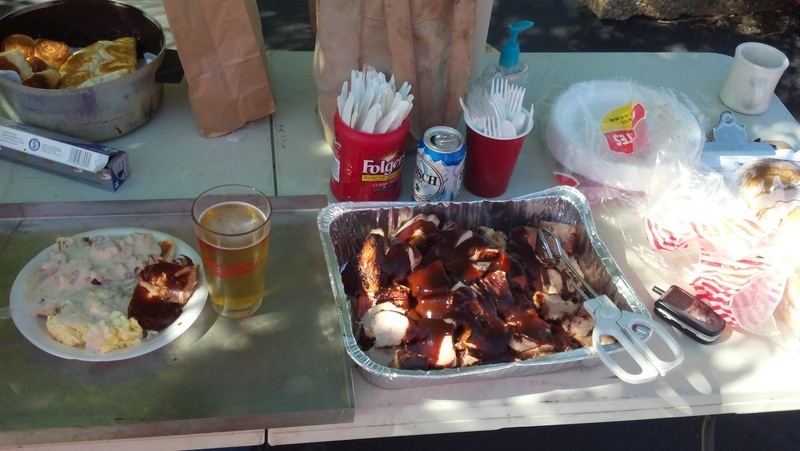 The tailgate was a huge success! We had a great turnout and an even bigger one for the game! 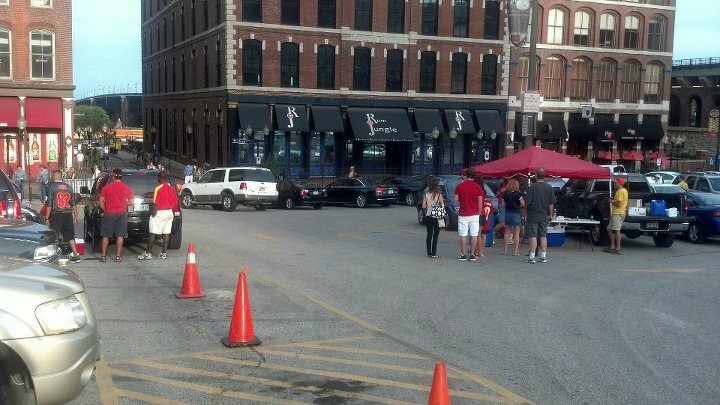 Big thanks to everyone who came out and supported our club as well as Weber's and the Kansas City Chiefs. We had the pleasure of welcoming lots of new faces and we hope to see you all back this week for Buffalo! 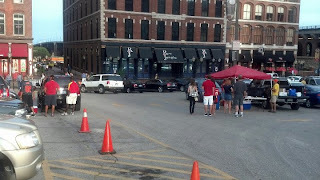 Check out some pics from the tailgate. This week we play Buffalo in New York. The game starts at 12pm and will not be televised on regular TV. 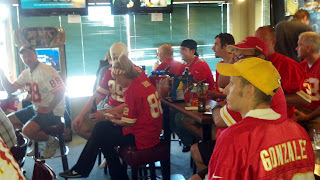 It is way more fun to watch the games with other passionate Chiefs Fans. Come join the fun. This week we get TAMBA HALI back! Look out Ryan Fitzpatrick! Weber's opens at 11am. Bring your Game Face and Good Attitude! THE SEASON IS FINALLY HERE!!! The Chiefs are finally back in action! 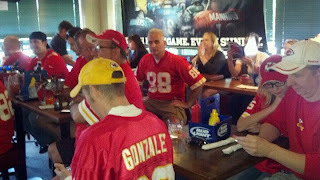 This Sunday, Sept 9th, 2012 the Chiefs host the ATL Falcons at Arrowhead Stadium! We will officially be back in business at Weber's Front Row! 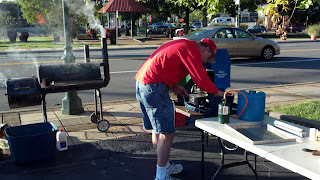 This year, we are having our annual Tailgate party in the parking lot of Weber's beginning at 9am. We will be grilling/smoking food for all Chiefs fans, we just ask that you bring some cash for a donation to the cause. All Chiefs fans are welcome. It's going to be a blast. Don't be shy, please join us. Then at 12pm we will see what this year's team is made of! Join our Meetup Community. Help make ours the biggest in the country! Thanks to everyone who came to our tailgate, old friends and new ones. We had an excellent turnout for the preseason game, despite the subpar performance for the Chiefs. 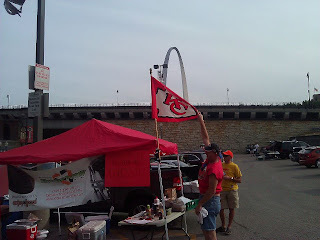 We had hamburgers donated by Weber's Front Row as well as handed out business cards to all the Chiefs fans we could find to get more of us together each and every Sunday! Here are some pictures from the event. Despite it being preseason we still had a good turnout. We will have an even better turnout opening week Sept 9th for our Home Opener vs. the Falcons. 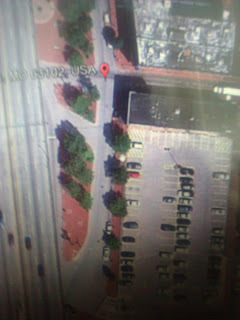 Here is once again the meetup page for that. We are hosting a tailgate for ALL Chiefs Fans sponsored by Weber's Front Row. Weber's has been nice enough to donate hamburgers for the party. Please bring anything else you may want to consume, including beverages. We will be at the corner of 3rd and Morgan. Pretty hard to miss us. Look for a big smoker, and a sea of red. CHIEFS!!! 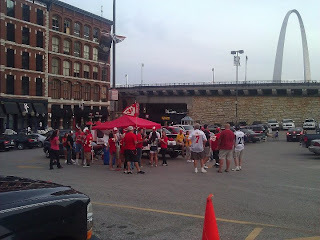 "The Official Website of the #1 Chiefs Meetup in STL"
For the People, By the People. "We Bleed Red And So Do You". All Chiefs Fans welcome.. Picture Window theme. Powered by Blogger.